Whatever term you use it is a place for children to have fun and beat the Texas heat! A spray ground is a zero-depth play area where water sprays from mounted structures or from the ground. What better way to beat the heat than to enjoy some time at a splash park near you? 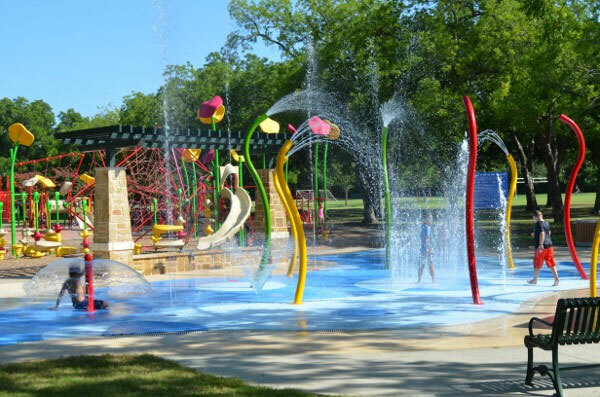 Check out this list of more than 75 Splash grounds, Splash Pads, Spray Grounds and family aquatic centers in the Dallas – Ft. Worth area. And, remember, though we try to keep this list as current as possible, it’s best to check the website or call ahead to make sure the location is open and working as usual! Dog Park at Bonnie Wenk Park – Sprayground for Dogs! If you know of a favorite Spray Ground in your neighborhood that’s free or relatively inexpensive, please let us know so we can update our list! Leave a comment below! (c) Copyright 2018 North Texas Kids. Okay to share the content directly from our site, or use an abbreviated version that links back to NorthTexasKids.com. Otherwise, please email us.